Last year, I had a tooth with composite bonding chip. My dentist retired and the new dentist suggested veneers. After realizing my teeth had fillings, he said he could only do crowns. Unfortunately, I didn’t question him because I knew nothing about this procedure at all. Now, I have six porcelain crowns on my front teeth that I hate. My front two teeth look gray in pictures and do not blend with the other four crowns. What can I do? So you have another cosmetic dentistry horror story. You have spent a lot of money and probably look worse than before you started. There isn’t a whole lot you can do except have at least these front two crowns re-done. Hopefully your dentist cares enough about his work that he will take care of this for you without charging you. In re-doing them, you should insist on a try-in before they are bonded, and you should make sure to get a good look at the crowns before they are bonded or cemented into place. And when they are tried in, that should be done with a clear try-in paste that will help transmit the color of the underlying teeth through the porcelain of the crowns. Since your dentist clearly doesn’t have much expertise in cosmetic dentistry and so is unlikely to have try-in pastes, he can just use clear glycerin or any other clear water-soluble gel which should work just as well. Otherwise, you can get a false reading of what the actual final color will be. If your dentist won’t do that for you or balks at any part of these instructions, you will have to go somewhere else. If that is the case, I would strongly recommend taking the two-hour drive to Atlanta where you can go to a real cosmetic dentist who knows what he or she is doing. Check our list of recommended cosmetic dentists—any one of them could do a beautiful job of this for you. I have had 6 veneers done on my top teeth. They are too bulky and not natural looking. When I first started the process I was very clear with the lab and the dentist what I wanted. He sent back the first set because they were too bulky yet continued to use the same lab. At this point most of this was paid for so it wasn’t like I could have just gone somewhere else. It was all very rushed. There was no style guide whatsoever provided either. I really tried to be patient and put my trust in this dentist professionally. He was nice and everything but that is totally irrelevant. The day of the cementing I was totally stressed with this whole process and when they held up the veneers for me to see they kept falling out making it impossible to make a proper judgment call. I was unsure about it but they kept telling me that they could make adjustments after. Which was untrue. They were not able to, hence me reaching out to you. I have tried for the last month or so to get a hold of the dentist, asking for a refund and I’m being avoided it seems. Any advice would be so appreciated, how do I get my refund? I’ve cried so much over this, literally. It’s my teeth not a haircut—teeth don’t grow back after all. Your basic problem is that the vast majority of dentists, while they may know in theory how to place porcelain veneers, don’t have the artistic inclinations to do a smile makeover. At the same time, most dental laboratories, while they know the mechanics of making the porcelain veneers, don’t know enough about the artistic aspects of the work to do a smile makeover. So you go in to this dentist and you say you want porcelain veneers, and he thinks he can do this and thinks his regular dental lab that he uses for crowns can do this. When the first set came back completely inadequate, he’s not going to sour this long-standing relationship with the lab by demanding a refund and switching labs. Every excellent cosmetic dentist has had a first smile makeover. I had mine, and I will tell you honestly that I wasn’t proud of how it turned out. But I have learned over the years in talking with hundreds of cosmetic dentists that the excellent cosmetic dentists have a fundamental difference in attitude in that they will not be satisfied unless the patient is excited with the result, and they will go through whatever expense or work they have to until the result is beautiful and makes the patient happy. You will never have what happened to you, where they pressure you to accept the result. In my case, my first smile makeover patient was borderline satisfied with the result and didn’t object to my bonding the veneers. But the teeth didn’t have any sparkle, and when she came back for a checkup I told her that her results weren’t good enough, that I didn’t want a mediocre smile out there attributed to me, and I re-did them with a different lab completely at my expense. I have learned since that this is what all of the really good cosmetic dentists will do. So your dentist, because he lacked this commitment to your satisfaction, either didn’t bother to learn about try-in pastes or decided to skip that step so that you weren’t able to see for yourself how this would turn out before they were bonded. And now, rather than wanting to fix it, he doesn’t want to be bothered. To get satisfaction and to hopefully get a refund, you’re going to need to get an excellent cosmetic dentist on your side. We’re a little thin on recommended cosmetic dentists in the Toronto area, but we do have Dr. Goodlin there. I would go to him for an opinion, and see if he will work with you to try to get a refund from your dentist. A call from one dentist to another can be very persuasive. Your legal leverage in this case, unfortunately, isn’t that great if the veneers have stayed on and are functionally okay. Your dentist has probably met those two standards, which is how the profession at large will judge your case. Your best point to make, legally, is that you were pressured to have the veneers bonded on against your will with false promises. If you have to go to a lawyer to get enough pressure on this dentist to refund your money, that is the point your would want to make. I wish you well and hope you end up getting the beautiful smile you thought you paid for. And a tip for others in your situation—even though you have paid for the work, you can switch to another dentist at any point. A dentist is ethically obligated to help facilitate that change, for whatever reason you feel you need to switch. I recently had my six front teeth, from canine to canine, crowned. Doing this it closed a large gap between my two front teeth. Now I can’t speak clearly and because of the closure and the stress of trying to learn how to speak again my jaw and neck hurt all the time. Also, my mouth stays dry and my lips are numb what could this be caused by?? Also is it possible to get the space put back between the two new crowns on my front teeth?? Your advice would be appreciated. This sounds like a serious problem that needs to be addressed. I am pretty confident your troubles have nothing to do with closing the gap between your two front teeth, but are because of other problems with the crowns. I closed many such gaps in my practice and never had any adverse feedback like you are giving me—no speech issues, pain, or dry mouth. It sounds to me that your dentist opened your bite too far. It could be that your crowns are too thick and/or too long. This could cause a problem called lip incompetence which is the failure of the lips to close naturally, without effort when your teeth bite together. If your bite is correct, when you put your teeth together, your lips should naturally fall into place and be closed without your having to think about it. Your dry mouth and the numbness in your lips suggest to me that you may have this lip incompetence. Also, if your crowns are too thick, they could throw off your bite leading to pain in your jaw and neck, besides causing speech problems. Both the pain and the dry mouth are serious problems. The pain issue is obvious. The dry mouth less so but is just as important because it can lead to rampant tooth decay. The washing and buffering action of your saliva, plus the antibodies it contains are critical in fighting tooth decay. Don’t let this go on. You really need a second opinion. I’m suspecting that your dentist got in over his or her head in doing this many crowns simultaneously on you. That’s my guess. I’d go to one of our recommended cosmetic dentists to evaluate the result and see what needs to be done to fix it. I recently had four of my front teeth bonded. My two very front teeth overlapped one another slightly and the dentist ground down both of them. The lateral teeth were set back in my mouth, and those are filled out to make it look more like a normal arc. My teeth are very uncomfortable and sharp feeling inside where he did the grinding down of the teeth. In other words, he “sacrificed” the one front tooth by grinding down the side of it in order to make the other front tooth look straighter. In addition, he also made the teeth a shade that is yellowish to “blend in”, no matter how much I protested. I have had such terrible regrets about doing this. I wish I could go back to the way my teeth were before the work because they were still intact and not damaged as they are now. I know there is no going back but would love your opinion on my options at this point. I have also had a problem at the gum line for a couple of years now, with there being a gap that has had to be bonded a couple of times before this work was done. I went with the bonding because I did not want to do anything drastic, but in fact that is what I had happen. I would like my teeth to be whiter and also not have that “damaged” feel to the back and sides of them. They were ground down quite a bit. I am very upset and this dentist is very difficult to deal with. I know this is rambling but if you have any advice for me, I would greatly appreciate it. Thank you for your time and assistance. Your explanation of what happened is clear enough that I can help you with what to do from here. This type of cosmetic bonding work is really beyond the ability of, I would estimate, 98% of general family dentists. It requires some artistic sensitivity, stocking a variety of dental bonding materials beyond the ordinary inventory that most dentists have on hand, and a fair amount of training and experience beyond dental school in shaping, coloring, and polishing the dental bonding materials, besides the shaping of the teeth. I would need a photograph to see exactly what went wrong here, but I can tell enough to be able to say, with a fair level of confidence, that you aren’t going to get a pleasing result from this dentist. This is not to disparage him. I imagine he did the best he could and the work is probably up to the standard of care for general dentists. Your case was just over his head. The good news is that there are a couple of excellent cosmetic dentists in Washington who are not too far from you. Go into our find a cosmetic dentist directory, type in your zip code, and it will pull up the recommended cosmetic dentists near you, either of which I’m confident could get you an attractive, comfortable result. I had $60,000 worth of dental work done in Croatia for $11,000. It was a great deal until the veneers are starting to fall off. That was in September 2015. I have a 10-yr warranty so I will be going back in September for hopefully permanent repairs. I was eating a piece of chocolate cake in March when the veneer to the left of my front tooth popped off intact. A week later eating spaghetti the other one on the side of the front tooth fell off. Today after eating spaghetti one of the front teeth popped off. I had all on 6 done on the upper and an implant and replacement crowns on the bottom. I don’t think this should have happened. I thought we got porcelain and I have not been eating with my front teeth, I cut everything up as instructed. My husband and I are baffled why it is not very strong. Will they have to re do my entire upper teeth or will they glue this back on? I can’t have anyone else touch it as it is under warranty so now I am gluing them on with Polident which lasts 3 hrs. I am so bummed out 4 months before I can get them fixed. Thanks for any insight. When they told you not to eat with your front teeth, that’s a big red flag. Properly bonded, you should be able to eat anything you want. Your dentist’s instructions remind me of what one patient told me – that her dentist told her that her porcelain veneers would come off every few months. A dentist who is placing these correctly wouldn’t put any of these restrictions on your activities. I wouldn’t have any reason to believe that if they didn’t know the right way to bond on porcelain veneers in 2015, why they would know now and do it right. Why are you going back to these people? Knowing that they didn’t know how to do porcelain veneers right, I would question all of the work they did for you–the dental implant and the crowns. I would recommend a second opinion on all of it. What to do about your smile for now? If the veneers are truly porcelain and if they have fallen off intact, an expert cosmetic dentist should be able to clean them up and get them bonded correctly. But this is beyond the knowledge and abilities of probably 95% of family dentists. You need a dentist with strong expertise in cosmetic dentistry bonding techniques, who knows how to etch the porcelain and bond it correctly. The cost for re-bonding these veneers should be relatively small. I would recommend going to one of the cosmetic dentists we recommend and having them fix this for you. I had porcelain crowns for all upper and lower teeth. Ever since these were put in I have had dry mouth. This was a cosmetic procedure and I obviously regret doing it. I am wondering if there is anything I can do next. The dentist widened my bite so you can see more of my teeth when I smile and I try to remember to keep my mouth closed and breathe through my nose. I know the dentist can grind down the new crowns and try to match my original bite but not sure if that is really a good answer. Any ideas you have would be greatly appreciated. So you had crowns on all your teeth–we would call that a full-mouth reconstruction. You wanted more teeth to show, so the dentist “opened your bite.” In lay terms, he or she made the crowns “taller” than your natural teeth were. Unfortunately, this hasn’t worked out so well for you and now you are suffering from dry mouth–called xerostomia in clinical terms. This isn’t just an annoyance but is a real threat to the health of your teeth, which I will explain below. It’s caused by a condition that is called “lip incompetence,” which is defined as a lack of closure of the lips when the mouth is at rest. In other words, you have to consciously try to keep your mouth closed. This was a serious mistake by your dentist, and in my opinion he or she should accept responsibility for getting this corrected. If he or she doesn’t, you have a valid case for malpractice damages. Was your dentist so attracted by the high fees from doing 28 crowns on you that they jumped into this case and got in over their head? That is possible. Dentists don’t get enough training in dental school on full-mouth reconstructions. This is a highly complex procedure, and there are several post-graduate training institutes that offer this advanced training. The proper way to do a full-mouth reconstruction, especially if the bite is going to be opened, is to first open the bite temporarily by some mechanism. What I did was build up the back teeth with composite to test how far I could open the bite. It can also be done with temporary crowns, though that commits you to having crowns. As a patient, you should wear the temporary crowns or the buildups long enough that you can be sure you’re comfortable with the new opening. And the dentist should never open the bite beyond the point of lip competence. This is one of the key things that needs to be checked–with your mouth at rest, do your lips come together naturally or is it a strain to close them? This is the test that is used to discover how much you can open it. You never go past that point. Many people don’t realize that your saliva has important defense mechanisms against decay. Besides its washing and buffering action, it contains antibodies that fight decay bacteria and minerals that help remineralize early decay lesions. A serious complication of dry mouth is a greatly increased decay rate. And don’t think that your crowns make you immune to decay. It isn’t hard for decay to get in at the margins where the crown meets the tooth. Also, dry mouth exacerbates gum disease. With what appears to be a lack of prudence and care by your dentist in doing this case, I wouldn’t ask him or her to fix it but would seek a second opinion. I will email you privately a dentist near you that I would recommend for this second opinion–I don’t want to publicly give any more clues about your location. Yes, the bite needs to be closed down, but grinding the teeth down may not work. It may be that your case needs to be completely re-done at the expense of your dentist. Proper shapes of the teeth need to be preserved in order for you to have a healthy bite. And if the crowns have a metal foundation under the porcelain, you don’t want to grind through to the metal. So go to the dentist I recommend. If he feels that this is your dentist’s fault, ask him to help you get satisfaction from your current dentist. Based on what you’ve told me, it sounds like you could take this dentist to court for malpractice, but it’s always better to give them a chance to rectify the problem. I had a traumatic fall 12 years ago fracturing 2 front teeth and my smile was restored with root canals and Procera crowns by my family dentist. With age and time, I didn’t like the way my adjacent natural teeth looked with the Procera. Also, I had one left upper molar that had a pretty deep filling and was giving me trouble. I am 38 years old and that filling was almost 30 years old. I decided that it was time for a smile makeover. 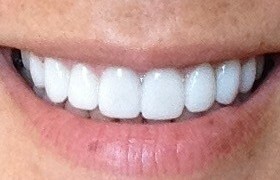 So I went to a cosmetic dentist here in Lexington who gave me a combination of porcelain crowns and porcelain veneers. I love my new smile. After the restoration however, my #9 front fractured tooth began giving me trouble. It was tap and pressure sensitive, so I went back to my cosmetic dentist and she told me I need to get an implant and another restoration. I had a gum pimple at the time and was referred to a periodontist. The x-ray of Aaron’s front tooth. I went on a course of antibiotics immediately (Amoxicillin 500 mg). I saw a periodontist last week and he confirmed that extraction of my newly restored tooth was needed. I requested my x-ray, showed it to my family dentist, and he doesn’t necessarily agree that extraction is warranted. He is contacting the West Virginia University, University of Kentucky, and University of Louisville dental schools to see if this tooth can be saved by periodontics or endodontics. I really do not want to lose #9, especially after a $1500 crown was placed, and not to mention IT IS MY FRONT TOOTH. Wish me luck. Please feel free to comment. I have attached the x-ray. I actually have a couple of problems with your smile makeover. Not with its appearance. You also sent a photograph of your smile and it looks great! But it leaves me wondering if your dentist took x-rays before doing this smile makeover or, if she did, if she fully comprehended what she saw or gave it proper weight. Your tooth #9 doesn’t look good at all. I have a fair amount of expertise in x-ray diagnosis and taught x-ray technique at the University of Minnesota, and I’ll tell you what I see. Right in the middle of the root there is a horizontal radiolucent line that looks like an old fracture. This must date from back to your original accident. 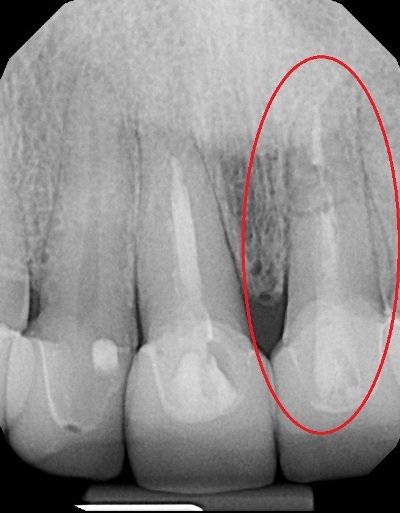 The root canal filling crosses this fracture line, so the dentist who did the root canal either didn’t see the fracture or figured he or she could navigate through it, remove all the necrotic soft tissue, and hopefully get healing. And it looks like this happened to some extent, at least. The end of the root looks healthy. But just above the fracture line, the tooth looks moth-eaten. It appears that some of the root canal filling material is gone. If the pimple on your gum traces to that area, that spells trouble. And my guess is that it does. The moth-eaten appearance suggests that there is infection eating away at the root of your tooth. If this is the case, the tooth is unrestorable. Does tooth#8 need root canal re-treatment? If this weren’t enough, the other front tooth is suspicious. If I had done this case, I would have addressed the problem with #9 before starting, but I would have also recommended re-doing the root canal treatment on #8, because the root canal filling stops several millimeters short of the end of the tooth. Now that the crown is on that tooth, I wouldn’t do anything more than wait to see if it flares up. There aren’t any signs on the x-ray of any infection here, just evidence of a situation in which infection could develop. So yes, I think you’re going to lose tooth #9. From everything I can tell, your dentist is an excellent cosmetic dentist, so I would have her stay with this case and finish it. But I think she missed the diagnosis here and should make concessions on the fee to get this fixed right. If I had made this mistake, I would ask you to pay for the extraction and the implant but then not charge you anything for the implant crown. That would make it so the total fee you pay would be equal to what you would have paid had the tooth been extracted in the first place and an implant placed, which is what should have been done. Do you have a comment? We’d love to hear from you. Enter your comment below. My husband and I went to a local dentist who advertised cosmetic dentistry. We wanted Lumineers. Our teeth were prepped and impressions were taken. She told us the veneers would arrive in 2 weeks. Exactly 2 weeks later the dentist called and told us that the lab had called, there was a problem with the impressions, and that we needed to return to have the impressions redone. My question: is this common? We paid upfront so they have our money. Your thoughts will be so helpful as we are a bit anxious. Thank you so much. I’m a little concerned over your situation. That is not a big deal, to have the first impression not work out and to have to take another impression when you’re having laboratory work done. That happens in the best dental offices from time to time. And I’m confident you’ll get your Lumineers. What concerns me about your case is what I’m reading between the lines. Admittedly, I’m doing a little guesswork, but this is informed guesswork. And I have some advice for you on how to handle this. It appears that you are dealing with a dentist who may not know what she is doing. I’m drawing this conclusion from the time delay in discovering that the first impressions were inadequate and that this information had to come from the lab. Knowing what goes on behind the scenes with these things, here’s what appears to have happened. The dentist sent the case to the dental laboratory. The laboratory began working with them and realized that there was a fatal flaw in both impressions. They then called your dentist and told him that. Your dentist would likely resist, because this is embarrassing to have to tell a patient that they need to come back for new impressions, so the flaw must be serious enough to make the case unworkable. The problem is that the dentist didn’t recognize the problem herself, but had to be told. And it wasn’t just one of the cases, but both of them. Added to that is the fact that these are Lumineers, not another brand of porcelain veneers, and Lumineers tend to attract novice cosmetic dentists. Here’s what I recommend that you do to protect yourselves. Insist that before the Lumineers are bonded to your teeth that they be placed with try-in paste. Insist on this. If your dentist doesn’t have any try-in paste, tell her to get some, because you need to have a good look at these on your teeth and be sure that you are happy with them. If you have any hesitation at all, backing out before they are bonded onto your teeth is comparatively simple. They can always be sent back to the lab to be re-worked or even re-made. And if your dentist can’t put them in with try-in paste, or if she can and you’re not happy with how they look, you can easily switch dentists if it’s before they’re bonded. By the dental code of ethics, enforced by the dental board, your dentist has to cooperate fully if you want to switch dentists, even if it is in the middle of a procedure like this. She would have to forward the models and Lumineers to another dentist. And if it comes to that, let me help you find an expert cosmetic dentist who will be sure that your case turns out looking good. And don’t accept any excuses here. I have all kinds of stories in my files of patients who had try-ins like this and they didn’t like how they looked, and the dentist pressured them to having them bonded saying that once they got bonded permanently they would look better. Or they would look better in a couple of weeks. Or the patient would get used to them and learn to love them. Don’t buy any of these lines. Try-in pastes for Lumineers or other brands of porcelain veneers are water-soluble gels that will hold the Lumineers on the teeth very loosely–not firmly enough so that you could wear them out of the office, but enough so that you could stand upright and look at yourself in a mirror. As I said, you and your husband need a good look at these before they’re bonded on, and if your dentist can’t do this for you, then you can find a dentist who can. Now there are other possibilities for what has happened here. It’s possible that the impressions were damaged or lost after being sent to the lab. Or it could be something else. But I would still insist on the try-in based on this suspicion that we’re dealing with a novice. Excellent cosmetic dentists will all do this and if you have any hesitation about how the smile makeover looks, they will insist on fixing it before they are bonded on. Do a search on “beautiful smile guarantee,” and you’ll find the websites of a number of dentists we have advised about this and will learn how each of them has a variation of this same practice. They will try on the veneers before they’re bonded, and if you don’t love them, they will adjust them or even re-make them until you do and then bond them on. And maybe this is what your dentist was planning on doing all along. But if not, you still have a right to insist on this. I have an 18-year-old daughter who is missing the tooth next to her front tooth. She had a baby tooth there when she was little but there was never an adult tooth. The dentist told me the tooth next to that tooth would just shift into place. Well it kind of did but there is a gap and she does not like it. She doesn’t want to smile or take pictures. I took her to a dentist recently and they said she would need braces to shift the spot over and then add an implant, she does not want braces. Do you have any other ideas that we could do? Well, you got bad advice on two levels. No only did the tooth not shift the way your dentist said it would, but even if it had, the result would have looked funny. This would have been pretty simple had it been addressed when the baby tooth came out. Your daughter could have had a temporary flipper partial replacing the one missing lateral incisor, and it would have looked okay and would have served until you were ready for a permanent tooth replacement. Anyway, the second dentist is right. Not just from an esthetic standpoint, but also from a functional standpoint, the canine tooth should be moved back to where it belongs and an implant placed. The canine tooth is a key tooth and one of its functions is to protect the back teeth from sideways stresses. It has a very long root and it is a thick tooth, and in a normal bite it absorbs the sideways stresses when you chew. This is called canine-protected occlusion. If that tooth is out of place, your daughter could develop costly complications later in life. And then there are the esthetic issues. Because of its size and shape, it is very difficult to make the smile look normal when you have this canine tooth in the place of the lateral incisor. The lateral incisor is a delicate tooth and thin. There is no way to make the canine that thin so it looks like a lateral without destroying the tooth. There are ways to move front teeth without conventional braces, and maybe she would be okay with one of those methods. There is Invisalign, that can move the teeth with clear plastic aligners so that no one will know she has braces on. Is that what her objection is–she doesn’t want to be seen with braces? If your dentist hasn’t suggested this, just search for an Invisalign dentist near you. Or there is Six-Month Smiles, a technique for moving just front teeth quickly. That might work for her. Her smile is so important for her social relationships, especially at her age. I would encourage her to get this done. 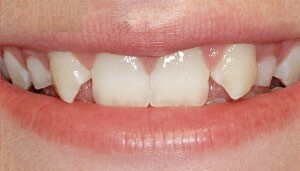 Here’s an example of what it looks like to have the canine teeth where the lateral incisors should be. And this isn’t something that you can fix easily with bonding or porcelain veneers. A canine tooth is too bulky to be able to make it look like a lateral incisor. And Sandy’s daughter would look worse than this because she’s missing the lateral incisor on only one side. I had my veneers redone twice already within 3 months. The first time was done in May by an inexperienced dentist and the veneers were very thick and bulky. I didn’t like them and went to a very well known cosmetic dentist to have them redone; this was in August. After redoing the veneers twice and paying 18k the second time, I’m still not happy with the result. The veneers are dull, dark, very opaque and have no texture. I want to redo these veneers. My question is: Is it safe for my teeth if I redo my veneers for the third time? I hate my veneers but at the same time, I don’t want to end up having a root canal or not have any enamel left. Having gone through this process twice, (the first time with a general dentist) I can honestly say that this cosmetic dentist is very skillful, meticulous and really good at what he does. His mock up for the temporary was beautiful and I was very impressed. I think the problem here is the lab or lab technician. I loved the temporary and expected the final result to be like the temporary or even better, but it wasn’t. When I tried on the veneers, right away I saw the dullness, the opacity and the lack of texture. The color was also a few shades darker than the color I picked for the temporaries. I told the dentist I didn’t like them. He said he had to make some adjustments to the veneers so the surface looks dull, but the dullness will go away when he polishes them at the very end. Opacity: he said he could send them back to the lab to make them more translucent but it won’t look nice. Lastly, he said if I wanted to know whether remaking the veneers will be nicer than this, the answer is, no. So he left me no option and I caved to have the veneers cemented that day. My veneers are shiny, but lack the gloss and texture so therefore they look dull. And in close examination, I see a lot of tiny scratch marks/abrasions. I called the dentist the following day to let him know I wasn’t happy. My follow up appointment is in two weeks to see what we could do. It’s disappointing that I paid a lot for these veneers but I feel like the quality is below average. This is the reason why I want them redone, but I don’t know if it’s worth it putting my teeth through the trauma for the third time. 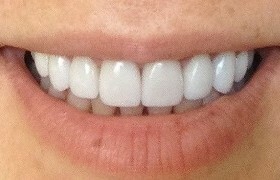 I’ve attached pictures of my temporary and my cemented veneers. Thanks for that detail and the photos. That’s very helpful. First, for the question you asked. No, there is no significant risk to your teeth for re-doing the porcelain veneers another time. In the first place, the preparation for porcelain veneers should be shallow, so there is little irritation to the teeth. When the teeth are prepared for veneers the first time, you do get some irritation to the teeth, but then they recover from that. And in the process of bonding the veneers, the bonding resin seals off the microscopic tubules in the teeth so that the second time, when the first set of veneers were ground off, there is less irritation. That irritation comes mostly from those tubules being opened up by the enamel being ground down, so sealing them off reduces that. The same thing for the third time. I am aware that some dentists will say that re-doing veneers is risky for the teeth, but they say that because they’re trying to talk the patient out of re-doing them–they want them to be quiet and just go away. But then there is the question you didn’t ask, which is how are you going to make sure you get it right this time? Let me back up a little and explain what went wrong with your second set of porcelain veneers. To do that, I’m going to give you a little insight into how I screen the dentists I recommend on mynewsmile.com. The first hurdle they need to cross to get recommended by me is that their work needs to pass inspection. I need to see good quality close-up photographs of their work. Knowing what to look for, I can judge whether they know what they are doing or not. But it’s the second part where it gets interesting. If their work passes my inspection, then I need to interview them on the phone. The most important thing I ask them is about how they insure that a patient will love the new smile they create–your question. How do they avoid your situation, where they do a smile makeover and the patient isn’t happy? They will tell me some type of procedure they go through. Many of them have a procedure like you experienced–the dentist will talk to the patient, determine their smile design preferences, and from that create a wax model of their smile. From that wax model they will make a set of temporary veneers that the patient will wear to make sure they like the design and the color. Then they will have the laboratory technician make the permanent veneers to the same specifications. They can take an impression from which they make a model of the veneers to send to the lab, and they can also take a photograph to send. In order to qualify for me to recommend this cosmetic dentist, they need to pick up on this lukewarm response immediately and be highly disappointed that the patient isn’t more enthusiastic about how they look. And they have to be willing to send them back to the laboratory technician to be completely re-made, if necessary, and refuse to bond them on to the patient unless the patient is not just satisfied, but excited about how they look. This clearly didn’t happen in your case. The dentist, rather than addressing your concern about the color and the luster of the veneers, he pushed you into having them bonded on and told you that the dullness would go away later. Wrong response. And the dullness didn’t go away, did it? He would have flunked my interview with a response like that. All the great cosmetic dentists I know would have stopped right there and sent them back to the lab to be remade so that they had more sparkle, more lifelike translucency, and a brighter color. All those things are do-able. The other glaring error here is that the permanent veneers were not made to the color you and this cosmetic dentist had agreed upon with the temporary veneers. This is way off. I think you have grounds here for a legal complaint, because the end result was misrepresented. I agree with you that the final veneers look too dull and the color is off from what the temporaries were. In looking over this dentist’s work as displayed in photographs on his website, I believe he is capable of beautiful work. So I would recommend as a first step trying to assert your rights and telling him you need this re-done. This is not fixable by polishing or trimming–your case needs to be re-done. You may show him my email, if you think that will help. If that doesn’t work, get back to me, and I’ll see if I can line you up with a cosmetic dentist who is not only a good artist, but actually listens to his or her patients. They may be able to help you put pressure on this dentist to give you a refund. And about this being the lab’s fault–it’s the dentist who gives the instructions to the lab, and the dentist who has to take responsibility for the final result. It was your dentist who decided to not send these back to the lab and demand better work. So you can’t blame this on the lab.